A PCB, case, and components kit will be offered at diy-audio-kits.com, plus we offer to build and test the Genera phono preamp project for all those not blessed with DIY skills - watch out for updates here. The "open-resource" Genera (generic) phono preamp project starts here. And the icing on the cake is my secret ingredient all constructors will be able to fit (for a modest cost) that turbo-charges this thing into a "tube" phono preamp, without any of the short-lived ghastly glass beasties! This is a totally new project, and I've not tried it out in advance, so here you will also get an insight into what really goes into a Graham Slee phono preamp project. One thing we do have is the Gram Amp 2 Communicator phono preamp case printed with DAK (diy-audio-kits) logo and the name Genera. The constructor does not need it to build this project, but it will be offered along with a PCB to construct a neat phono preamp for those who want it. Here are the pictures of the phono preamp case. The technical bit starts next post. The Novo kit demonstrated that discrete circuitry could be very problematic to the inexperienced: too many things to get the wrong way round, and in the case of a transistor - the rest (or most of them) blow with it. Therefore, for the Genera phono preamp it has to be an op-amp (operational amplifier chip), and just one at that!. But is that a dual op-amp, or a single? In the Genera phono preamp it's going to be two singles, one per channel. The reason why will become apparent as the design progresses. What performance can you expect? I'm looking for another winner here, so this is not going to be second-fiddle to a Gram Amp 2 phono preamp: I want it to do better or at least equal. So how do I go about chosing an op-amp? First we have to take a look at the RIAA reproduction curve. The chart  above shows the output from a RIAA record according to a magnetic (moving magnet or moving coil) cartridge. To end up with a flat frequency response, the phono preamp frequency response has to be the inverse - the chart upside down. The above chart  shows the curve from the first chart, upside down - the black curve. 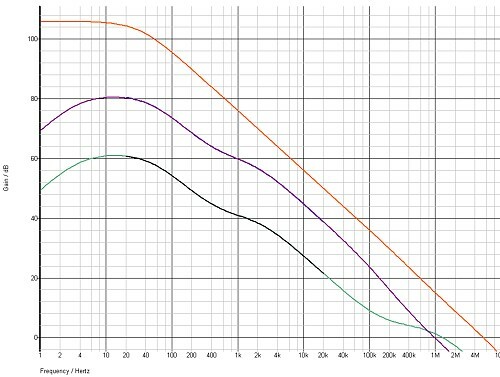 It is part of the blue-grey curve which shows the extended frequency response we can expect. This is the RIAA reproduction curve of our proposed phono preamp. 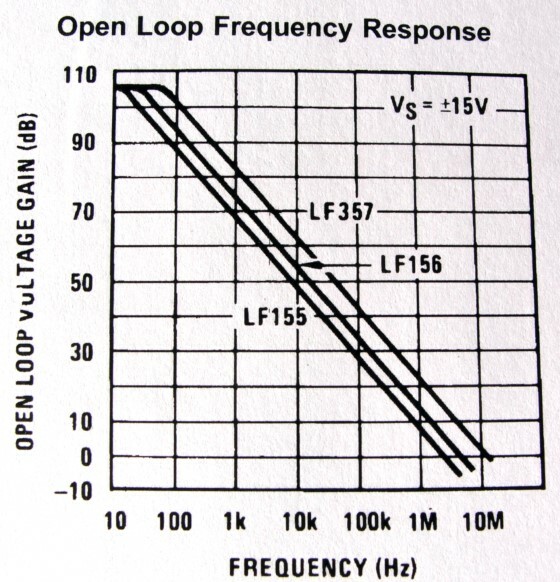 The red curve is the gain bandwidth product of an op-amp called the LF356, and below  is the same taken from the data sheet: the curve has the callout LF156, which is the family name covering the LF356. The gain is inside the curve, that is to say to the left and below the curve. At approx. 5MHz the curve intersects 0dB on the x axis. Therefore the Gain Bandwidth Product is 5MHz. In actuality it is stated on the data sheet as 4.5MHz. Where the gain is maximum at about 105dB - a gain of approx. 178,000, the bandwidth read from the graph is only about 30Hz. In fact, if we know the Gain Bandwidth Product is 4.5MHz then at 105dB gain the bandwidth is 4,500,000/178,000 = 25Hz, which correlates with our estimations off the graph. To ensure an undistorted phono preamp using this op-amp, the phono preamp gain and bandwidth needs to be well within the op-amps curve - a rule of thumb being a factor of ten. 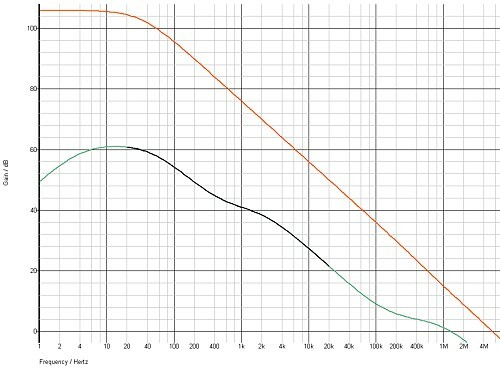 For a 41dB gain (just over 100, and suitable for a moving magnet pick up) as shown in the second  graph, the rule of thumb exists frequency wise. In the direction of gain we have over 40dB spare, which more than covers the rule of thumb... 40dB being 100. Can the gain of a phono preamp be increased? My stock reply is NO. But then it's challenged: "but other manufacturers do so"
We now only have a factor of 4 in the direction of frequency, where we wanted the rule-of-thumb ten. There is still sufficient gain at low frequencies however. By getting too close to the op-amps Gain Bandwidth Product (GBW) curve we lose the accuracy of the reproduction curve - you may be able to see it is slightly different - and so the RIAA EQ component values need recalculating to give the required reproduction curve. Therefore a simple gain adjust or switch won't do! This is why so many universal phono preamps disappoint in one setting or another. Another problem is that being so close to the op-amp GBW curve is that we lose some stability, which can be seen by the steeper high frequency end of the 60dB gain curve. These are very important considerations when designing a proper high fidelity phono preamp. Edit: To get the gain required for moving coil from a single op-amp, a type with a transconductance (non-degenerated bipolar transistor) input stage is required to get the gain up (and also for low noise). It also requires a large GBW product. There are precious few op-amps that can do this. Therefore, at a later stage I shall discuss and provide a neater solution for moving coil. Here's the internals of the LF356. What's striking is the virtual absence of PNP transistors! As engineers who've used their ears with transistor amps will tell you: PNPs are cr*p! Unfortunately many in Hi-Fi believe the opposite. Now, I know I don't have the writing skills of JLH - I don't have that convincing "it's like this because I say so". But the textbooks bear me out, and so does Analog Devices, although they use them in most of their op-amps, explaining that theirs are superior. However, I have always been left wanting - missing the sound I easily recall from my early days. Like I mentioned earlier: "I want this to be a winner". By transconductance I mean bipolar transistors that don't use emitter resistors. Bipolars that use emitter resistors (as those in the voltage amp differential: R2 and R3) sound far better because they're very much more linear, but suffer noise because the emitter resistors degenerate gain, so there's less in the form of negative feedback, to reduce the noise. The LF356 FETs are no different - the noise stacks up alongside an equivalent degenerated bipolar input stage. But, if it were bipolars it would have to be PNPs to complement the NPNs in the next stage. So FETs here were a good choice! It also makes the LF356 have extremely high input resistance (impedance when talking about signals). I've used the very similar LF351 (LF353 dual) and the TLO71 (TLO72 dual, TLO74 quad) in phono stages, and they did sound really nice. The TLO71 variety was the only one to project Hendrix a good 4 foot behind the listening position (spooky), but in these days of noise specmanship... need I say more? Eagle eyed op-amp historians will also notice the NE5534 output stage!!! 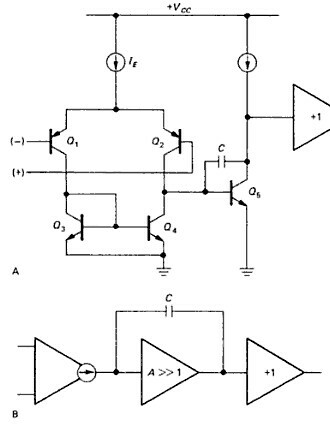 Transistor Q2 is an emitter follower driving Q14 which takes care of the negative going "push" and Q3 which takes care of the positive going "pull". Give Q14 some more current gain with an (erm) good PNP, and you have the same circuit as many a great old time high fidelity power amp! Designs such as that of Leak, as well as my 70's home built disco amp used such an output configuration, and progress has done little to better it. Notice C2 in the voltage amp differential. I'll be talking about that next. From previous post: "Notice C2 in the voltage amp differential. I'll be talking about that next." Here (fig. A) we have the innards of the opamp represented by bipolar transistors, but you may be able to see the similarities (because they are there) between it and the innards of the LF356 shown last post. Slew rate is one of those really hard to grasp properties in electronics. Here I will do my best to explain so you all understand it a bit better. Capacitors store charge. 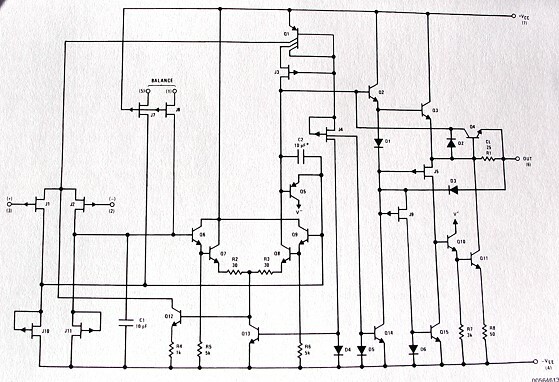 To obtain the charge you'd place a capacitor across a voltage. That would cause a current to flow from the voltage source for a period of time required for the capacitor to adopt that charge - with me so far? So we have five properties here: charge (Q) in coulombs; capacitance (C) in farads; voltage (V) in volts (of course); current (I) in amps; and time (T) in seconds. Slew rate is volts per micro-second, and so we can use the V and the T like this: V/T (Voltage divided by Time), which represents volts per time (got it?). 12/0.000,001.T (which means 0.000,001 x T, which means micro-second), or put it all on the top line (by doing dv/dt), which is 12,000,000. From the data sheet we know C = 10pf. which suggests that the current called Ie in the above diagram is 120uA, or that the current flowing in the differential input stage of the LF356 is 120uA ??? Not having the "confidential" information from National Semiconductor to confirm this, I can only assume that it is the case from what the maths say. But is 120uA is quite typical for this sort of J-fet input configuration? I would have thought it would be more, especially as the input noise voltage is pretty good, and that usually suggests more FET drain current than 120uA (60uA per device). And if the current were higher, then the slew rate would be higher too. But it isn't. The limiting factor here is input stage linearity. It's far better than that of a non-emitter degenerated bipolar transistor, but nothing electronic is perfect. But a transconductance input stage results in a slew rate 0.3 x bandwidth, which for 5MHz would only be 1.5V/uS. The LF356 is stated as 12V/uS which can be taken to mean that it is 12/1.5 = 8 times better linearity. Spent some time looking for my old copy of 'Art of...' sure I still had it, your not getting any replies yet but from the views there is a lot of interest so please keep up.